Map showing the building footprint of the East Boston Immigration Station, in 1922 from the Atlas of the City of Boston. Last month, advocates for East Boston’s immigration station finally received a negative response to their quest for landmark status for the building, clearing the way for the structure to be torn down. In memorium: The East Boston immigration station opened in 1920 on property purchased on waterfront Marginal Street in 1909. 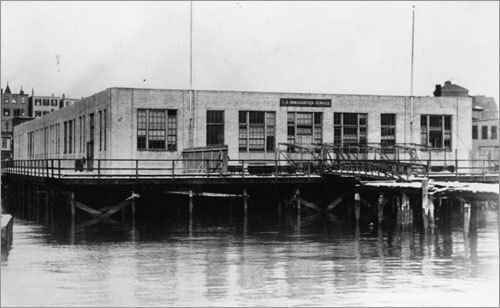 Originally officials planned to use one of the Harbor Islands to replace their rented quarters on Long Wharf but the Marginal Street facility was built instead and operated through 1954 as a processing point for new immigrants to the region. Passengers originally questioned on the steamboat docks arrived in the building for further interviews and to resolve paperwork irregularities, also, sometimes, to be interned. A view of the East Boston Immigration Station from the water, from the Globe Archives, c. 1922. More Reading: The Boston Globe put together a gallery of archival images tracing the history of the building with some incredible images of the decay of the interior today. A City of Boston report on the station includes a very thorough history (including the original quote above) and more images. This entry was posted in Boston, Ephemeral Boston and tagged Anthony Guerrero, East Boston, Immigration Station, Marginal Street, Massport. Bookmark the permalink.